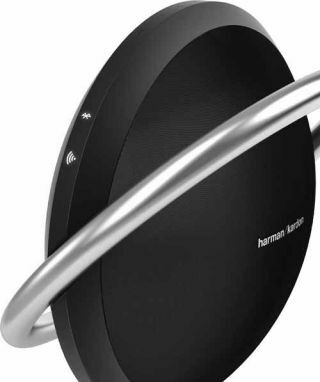 Harman Kardon expands range of wireless speakers at IFA 2013 | What Hi-Fi? We were expecting to see a lot of new wireless speakers at IFA 2013, and we haven't been disappointed. Harman Kardon and JBL (part of the same company) have no fewer than three new ranges on show between them: the Harman Kardon Onyx, JBL Spark and JBL Voyager. The Harman Kardon Onyx (£429, above) is a full-range sound system in a "compact, sculuptural enclosure". It has built-in aptX Bluetooth, AirPlay and DLNA for wireless music streaming from portable devices and computers. Ther's a stereo 3.5mm aux input if the user wants a wired connection, and a USB socket for charging your portable while it plays. Set-up is simplified by the inclusion of NFC (Near Field Communication) Bluetooth pairing with compatible devices. Four channels of amplification provide 60W (RMS) of power to four speakers: a pair of 7.6cm woofers and two 19mm tweeters. A built-in rechargeable battery gives a claimed six hours playback, and the unit can be controlled from a smartphone or tablet using the Harman Kardon iOS app. A leather-clad enclosure and stainless steel handle complete the package. New from Harman's sister comany JBL is the funky-looking Spark (£109, above), a wireless stereo speaker which has an unusual 'megaphone' shape and twin 4cm JBL drivers plus a tuned bass port. Available in five colours, the Spark has Bluetooth, a translucent body with mesh grille and comes with a stainless steel hanging hook, fabric cord with inline control and a power adapter. It can be hung on a wall, set on a table or desk or stashed on a shelf. Finally there's the JBL Voyager (£229), a portable speaker with a subwoofer docking system. Detach it from the bass dock and it becomes a go-anywhere, wireless Bluetooth speaker and speakerphone with SoundClear noise-cancellation technology. There's an aux-in jack and USB port for charging smartphones and tablets, and the speaker itself incorporates a 4.5cm driver, while the separate sub gets a 7.7cm driver. When connected to the subwooofer dock, the Voyager becomes a desktop 2.1 system.